WASHINGTON, DC — May 23, 2016 — Many Voices, a Black church movement for lesbian, gay, bisexual, and transgender (LGBT) justice, launched a first-of-its-kind video campaign in partnership with Morgan State University (MSU), to increase awareness about LGBTQ life on historically Black College and University (HBCU) campuses, and the ways in which it is shaped by the Black Church tradition. HBCUs have not kept pace with other colleges and universities in developing welcoming environments for LGBT students, though that trend has been recently changing. 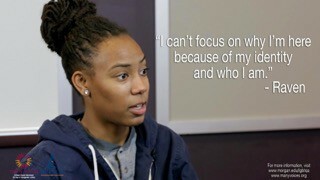 Titled My God Too: Black LGBTQ Students Speak OUT, the video features interviews of 10 MSU LGBTQ and non-LGBTQ ally students, who share their personal stories about how they have been impacted by traditional Black Church teachings regarding gender and sexuality that are pervasive on campus. The students bring forward a hopeful vision of what is possible if the Black community chooses to engage in social justice awareness at the intersection of sexuality, gender, and spirituality. There are 105 HBCUs across the country. According to a report released by the University of Pennsylvania, only 21 have LGBT student organizations. And, according to diversity expert and former Harvard College Dean, John Fitzgerald Gates, only three HBCUs have full-time administrative staff or a center dedicated to LGBTQ affairs. The Many Voices and MSU collaboration was funded in part by the Arcus Foundation, E.Rhodes and Leona B. Carpenter Foundation and Evelyn & Walter Haas, Jr. Foundation. It was produced by filmmaker, Algerson Vincent & VincentVisuals.